Successfully Added Camera and DVR with Motion Detection Recording to your Shopping Cart. Camera and DVR with Motion Detection Recording - there's more than meets the eye. 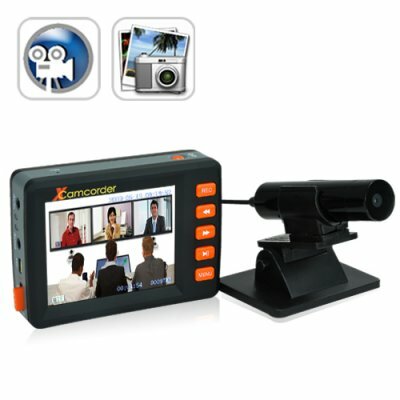 Video Recorder and Camera: With 720 x 576 video recording at 30fps and a built in microphone, this item makes an excellent personal camcorder. Along with the light weight and waterproof wired-camera, you can take this with you anywhere and expect the same perfect performance. This mini digital video recorder will also be great as your next tool for covert surveillance as it is small enough to be easily hidden. It is connected by an extension cord which can stretch up to 2 meters for instant viewing of those hard to get into places. One Touch Recording: Sick of missing those Kodak moments because you couldn't get your camera out in time? With this video recorder's one touch video recording function, you'll have the world at your fingertips. Even when the unit is turned off, all you have to do is flip a switch to start recording instantly - no menus, no loading, and no start-up screen. Motion Detection Recording: We tested this function in the office and its the best we have ever seen. Want to see who's been in your room/office touching your stuff? Set the mini digital video recorder to motion detection mode and watch it act like a security camera with real world results. It will automatically record any motion and then turn off after a certain period of inactivity, meaning it only captures the videos you need. Mounting Options and Accessories: This digital video recorder is jam packed with accessories to allow you to attach the camera to any device or part of your body you want. Mount it to your bike for use as a sports camera, stick it on the ceiling to use as a covert security camera, or strap it around your arm to have it act as a video camera! Compact, versatile, and filled with features, this product is great for any insurance inspector or investigator who needs a multi-function camera for filming hard to reach locations. Our usual Chinavasion low wholesale price makes the CVNU-DV37 perfect for the resale market, internet store, or special company use As always, it is only available from your source for wholesale direct from China electronic products, Chinavasion. I plugged the USB in, but it's not working. How to I get it to connect to the computer? First the unit has to be on, then you connect the USB cable. The screen will show "PC connection" when it is connected. How come all my files disappeared when I put in an SD card? Go to the menu to change storage mode from SD card to flash. Why won't this work when I connect it to the TV? When connected to the TV, go to the DV37's menu and change the TV settings to PAL or NTSC. I didn't have any problem with this company sending this item to the states.I also ordered another battery for this,and they got both the camcorder to me and the battery in a (short amount of time,)very impressive.All-In-All A very good camcorder,battery good,good pics and video with this,just wish this had it's own camera eye. )Anyway I would buy from this trusting and dependable company again.And Thanks China,for all your help in getting these products to me,I appreciate it very much. This camera and recorder works well. The Motion Detection is really good. Mounted it on my scooter and also on the dash of my car. Image quality is good and if you put a big enough SD card in it can record for a long time. So many different mounting options that come with it, you will always find a way of mounting the camera. Would work well attached to a cycle helmet or similar.